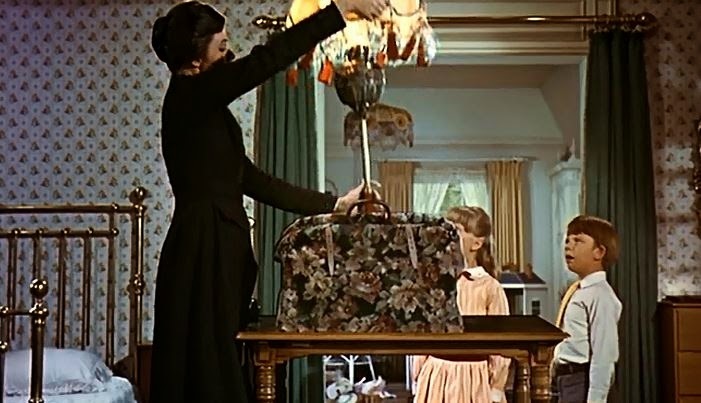 Mama Marcie: What's in My Purse? The Mama Purse - a magical space. I thought it would be fun to show you what is routinely found in MY purse - a mama, artist, teacher, oiler. Large with pockets inside and outside. Brightly colored a plus and chevrons a double plus! 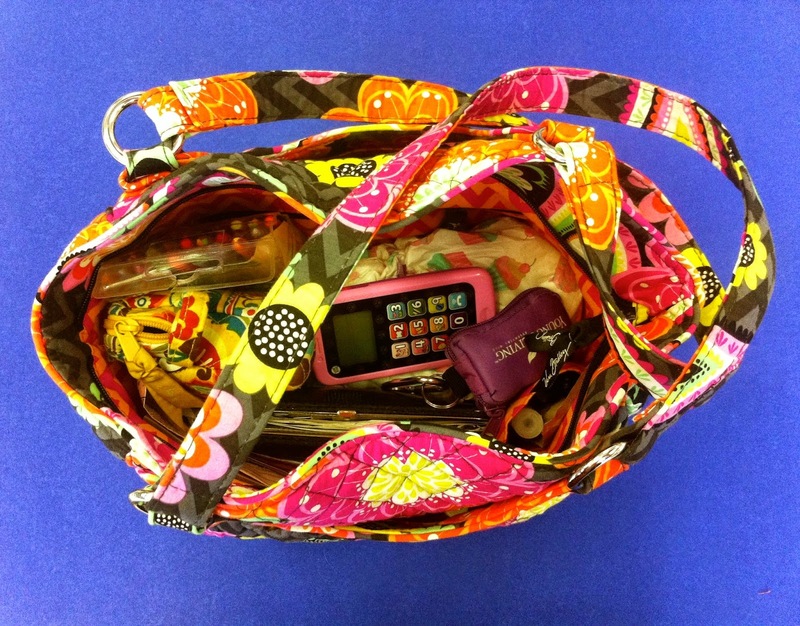 This purse happens to be a Vera Bradley, but lately I have been REALLY into Thirty One bags. 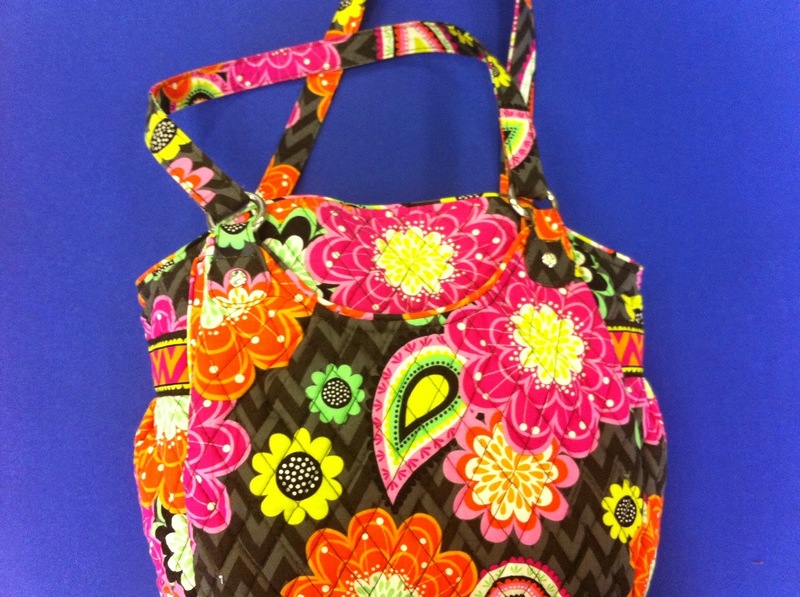 Check out my cousin's Thirty One site here. 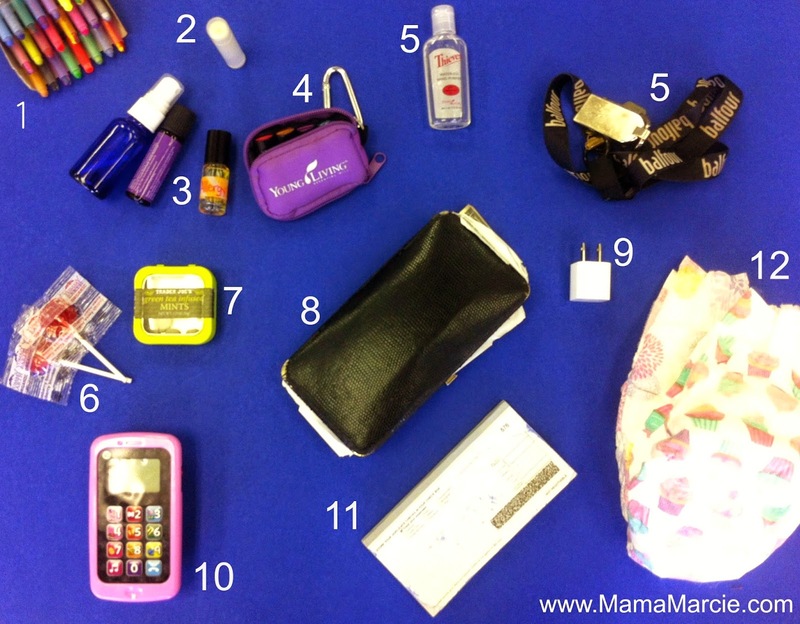 The cavernous purse of a mama.... a truly incredible sight! Want to know what all this junk is?? I have to say, when I pulled it all out, I was impressed that there wasn't anything weirder in my purse. Usually, I could win competitions for the most bizarre items in a purse, haha. 1. Crayola Twistable Colors - I keep these in my purse for my girls. When we are at restaurants or waiting rooms, they love to color. Mommy wins, too, because the girls are occupied and being creative. 3. Various Essential Oil Products - currently, I have home made bug spray, Tranquil and an Respiratory Blend that I made. 4. A travel case with 8 sample bottles of Young Living essential Oils. 6. Organic lollipops - my husband calls these bribery ;) We rarely get to this point, but occasionally the girls need a treat, so I keep a couple on hand. I bought these at Sprouts. 10. Toys - Likely, this was something that Olivia walked out of the house with and handed to me before school, but I generally have something to keep the girls occupied in my purse. 11. Checkbook - who uses checks these days?? I do. Once a month for our milk co-op and rarely for school stuff. 12. Diapers - We use Honest Company diapers and we LOVE them. Have you tried them? Click my link and you can order a FREE sample - you just pay shipping. I was sold after seeing the adorable designs, the amazing packaging and reading about their quality and attention to purity and the environment. Ok, now tell me - what is the weirdest thing in YOUR purse? ?